Camp at Edwards Depot, Hinds County, Miss. SIR: I herewith submit a report of the part taken by the Second Brigade of the Twelfth Division, commanded by Brig. 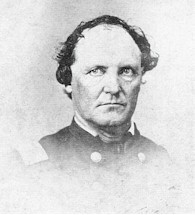 Gen. A. P. Hovey, Thirteenth Army Corps, on the 16th instant, at Champion's Hill, on the Vicksburg and Jackson Railroad, in Hinds County, Mississippi. My command consisted of the Forty-seventh Indiana Infantry, commanded by Lieut. Col. John A. McLaughlin; Fifty-sixth Ohio Infantry, commanded by Lieut. Col. William H. Raynor; Twenty-fourth Iowa Infantry, commanded by Col. Eber C. Byam; Twenty-eighth Iowa Infantry, commanded by Col. John Connell; and the First Missouri Battery, commanded by Capt. George W. Schofield. On the night of the 15th, we encamped on the Jackson and Vicksburg Railroad, near Bolton Station. In the morning we left camp about 6 o'clock, and moved east about 7 miles, when we approached very nearly to the enemy, drawn up in line of battle. In pursuance of orders of Brigadier-General Hovey, I formed the Second Brigade in two lines to the left of the road, in the field of one Champion, with the artillery in advance. Soon thereafter I placed my lines of battle in advance of the artillery, and ordered Companies B and G, of the Forty-seventh Indiana, under command of Capt. John F. Eglin; two companies (A and F) of the Fifty-sixth Ohio, under command of Capt. Manring, and two companies of the Twenty-fourth Iowa, under command of Captain ---------, as skirmishers, who covered the whole front of the line and advanced toward the enemy. Skirmishing soon began, and continued for about one hour, when I advanced the whole line, with the Forty-seventh Indiana on the right and the Twenty-eighth Iowa on the left. The thick growth of underbrush and vines, ravines and hills made it very difficult to advance, but it was accomplished with little disorder, until we reached the crest of the hill, where we found the enemy in very heavy force about 200 yards in front of us, and under cover of a wood beyond a field. Then the battle began with great fury, our troops advancing for the purpose of driving the enemy from the cover of the woods, which was done at double-quick and in a most gallant manner, the men loading and firing as they advanced, and unfalteringly receiving a most deadly fire from the enemy; yet they pressed forward, as men only can do who are prompted by intelligent motives of patriotic devotion to a common country, until the rebel force was driven from the covering and forced to fall back a distance of 200 yards, with terrible loss, the ground being literally covered with dead and wounded rebels. In this daring and determined charge all the regiments lost most severely. The Twenty-fourth Iowa most gallantly charged upon a rebel battery of five guns, and took it at the point of the bayonet, killing many of the cannoneers and driving the remainder from their guns and some 50 yards to the rear, when a new rebel line, which had not been in action, appeared in treble our force, and opened a most murderous fire upon our lines, which the unflinching and determined braves of the Twenty-fourth resisted for fifteen minutes, but, because of the overwhelming force brought to bear upon them, reluctantly retired from the battery, but kept the rebel re-enforcements at bay by their incessant fire and stubborn resistance. This battery was subsequently retaken, and is now in our possession. During this terrific charge, Maj. Edward Wright, of the Twenty-fourth, was wounded in the abdomen, immediately after which he captured a stalwart rebel prisoner and made him carry him off the field. The Forty-seventh Indiana, Fifty-sixth Ohio, and Twenty-eighth Iowa were all engaged at the same time against most powerful odds, which seemed to me to be five times their number, and held them in check for at least two hours, re-enforcements not reaching us. Our ranks being badly depleted, I directed the whole command to retire gradually from the field and take position near the crest of the hill where the rebel lines were first formed, which was done in good order, at which time a re-enforcement of one brigade came to our support, and after a few well-directed volleys, with the aid of the batteries, which General Hovey had massed on the extreme right, the enemy was routed, and fled in great confusion and disorder from the field. During this engagement, Capt. George Wilhelm, of Company F, Fifty-sixth Ohio, was badly wounded by a shot through the left breast, and was taken prisoner. After being removed about 6 miles from the field, he was left in charge of a rebel soldier as a guard. The rebel laid down his gun, for the purpose of taking some observations, when Captain Wilhelm grabbed hold of it and took his guard prisoner, marched him into camp, and delivered him over to the provost-marshal. The battery under command of Captain Schofield could not be brought into action until about 3 p.m., because of the enemy occupying a succession of positions where no command could be obtained of his lines, at which time our advance was made and the enemy driven from cover and in range of the battery, which dealt him so many terrible and damaging blows simultaneously with our fire and the fire of the re-enforcements that utter annihilation could only be prevented by a precipitate flight. Thus ended this unequal, terrible, and most sanguinary conflict, which, in point of terrific fierceness and stubborn persistency, finds but few parallels in the history of civilized warfare. For two long hours my brigade held in check fully three times their number, and I hesitate not in saying, had they not so gallantly and determinedly resisted, the fortunes of the day might have been greatly damaged, if not our glorious triumph turned into a defeat. During the progress of the battle my command took a large number of prisoners, which were handed over to the provost-marshal without any account being taken of them. Of the field and line officers I cannot speak in terms of too high commendation, each and every one discharging his duty with that degree of cool, determined valor which inspired the men to deeds of daring and wild enthusiasm which scarcely knew what resistance meant. To each and every one are the thanks of a grateful country due. Maj. L. H. Goodwin, of the Forty-seventh Indiana, and Maj. Edward Wright, of the Twenty-fourth Iowa, while gallantly leading their men, were wounded quite seriously, but I am more than grateful to know they are both rapidly recovering, and will soon be able to resume their respective positions. To those brave officers and men who fell in that sanguinary conflict, and who resolved to do or die in defense of and for the perpetuation of the best Government ever known to civilization, we cannot do more than assure their friends at home that they fell with their faces to the foe, in defense of the Constitution of a common country. To my acting assistant adjutant-general, Lieut. H. G. P. Jennings, of the Forty-seventh Indiana, and to my aides, Capt. H. E. Jones and Lieutenant Gates, of the Fifty-sixth Ohio, and Lieutenant [Theodore] Shaeffer, of the Twenty-eighth Iowa, are my thanks especially due for their bravery and efficiency. Again would I call attention to the daring and chivalric conduct of my orderly, Private George Phillips, of Company K, Fifty-sixth Ohio. His bravery and efficiency were the admiration of all who observed his conduct. Promotion is justly his due. I herewith inclose the reports of the several commanders, giving in detail the part taken by the respective commands. Col., Comdg. Second Brig., Twelfth Div., Thirteenth Army Corps.